UNITED NATIONS, December 28 -- The UN can be shameless, particularly but not only in Haiti. 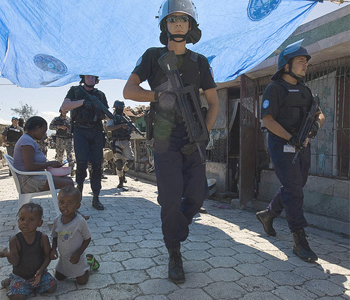 While the UN refuses to respond to a formal claim about introducing cholera to Haiti, and slowly studies without comment the recent beating of three Haitians by UN peacekeepers, it loudly presents itself as the defender of human rights in Port au Prince. What of the adage, Doctor Heal Thyself? "On Haiti, as the year ends, please state the status of the UN's "study" of the filed cholera compensation claim, and of any standing claims body which the claim says is required by the SOFA. Also, on deadline, what is the status of MINUSTAH's promised review, or confirm or deny this account... 'On December 13, 2011 in the afternoon, Joseph and Abel JOSEPH GILBERT, aged respectively twenty-nine (29) and twenty (20) years boarded a water delivery truck registered ZA 08937... Agents of Brazilian contingent of MINUSTAH arrested them without any explanation... Gilbert Joseph, Abel and Joseph Armos BAZILE were tortured in the courtyard of the Joint Educational Institution of La Saline, etc.'" When Inner City Press first asked about this incident, the UN replied the next day that it was being investigated. But since then, nothing, as with the question of the cholera claim. On cholera in Haiti: We've said the claim has been received and is being studied. We don't have any further comment at this stage. On the MINUSTAH review: DPKO advises that the UN Stabilisation Mission in Haiti, MINUSTAH, and the Conduct and Discipline Unit in the Department of Field Support at New York Headquarters are aware of the reports of alleged misconduct by members of the Brazilian battalion of the Mission. As with all cases of alleged misconduct, the responsibility to investigate and take any action, as appropriate, lies with the Troop Contributing Country. The case has therefore been referred to the Permanent Mission of Brazil. So the UN claims a "zero tolerance" policy, but in fact takes no action itself, leaving the entire "responsibility to investigate and take any action... with the Troop Contributing Country." Shameless? Negligent? There are other words. Watch this site.